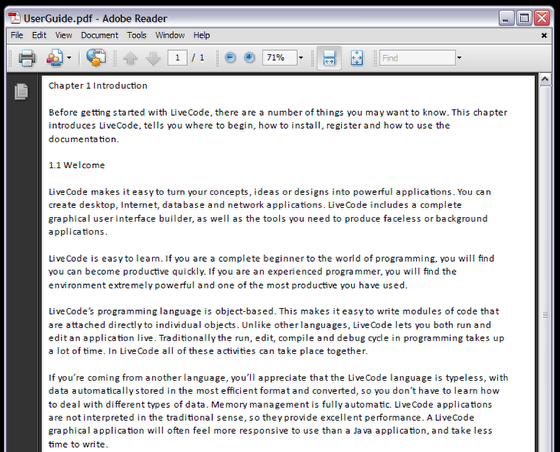 This lesson will show you how to create PDFs using LiveCode. We will see how to create external links within the document and create a document outline for the document. The LiveCode pdf printing commands are used to print cards of a stack. For this lesson we will use a stack with two cards to be printed. Each card has a field on it containing text from the LiveCode User Guide. 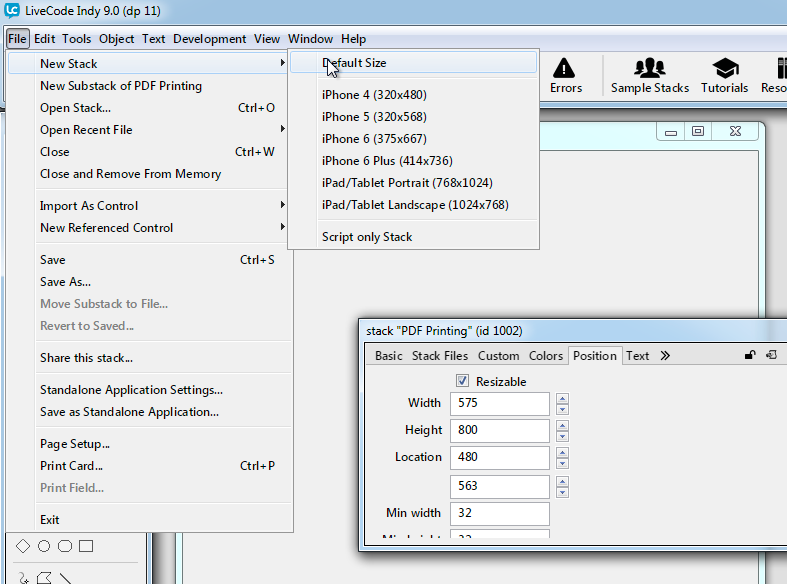 To create the sample stack select new stack > default size from the File menu and call it PDF Printing. The sample stack can be whatever size you want but as we will be printing to A4 it is best to have stack that has about the same ratio as A4 so the cards scale correctly when printed. I have set my sample stack to 575 x 800 in the Position tab of the Property Inspector. Add a second card to the stack using the New Card option in the Object menu. Go back to the first card by selecting Go First in the View menu. Add a field to the stack and set it to the same size as the stack, turn off any scrollbars on the field. Then put some text into the field. The card will be printed as you see it so ensure it looks just as you want it to appear in the PDF document. The first step is to create a PDF document by printing a single card. We use print into rect to scale the card to fit the specified rect. In this case the rect we give is the same size as our stack so it should scale perfectly. Now set up the second card of the stack with a field and some text in the same way as the first card. We need to update the printCards handler to print both cards. When printing multiple cards you need to put a page break after each card otherwise they will be printed on top of each other. Use the LiveCode print break command for this. 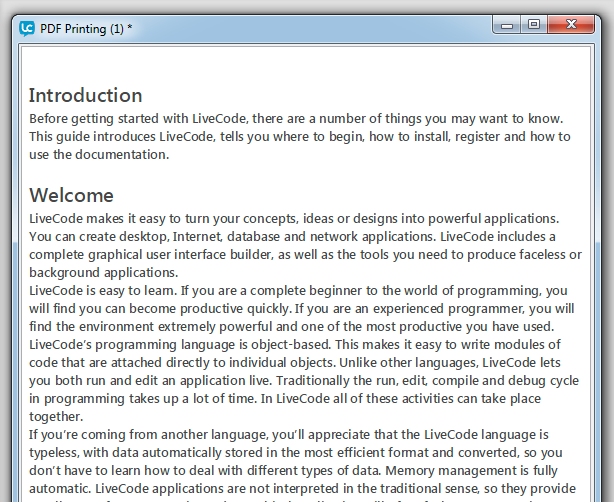 On page 2 of the stack there is a link to the LiveCode lessons. We can use the print link command to add an external link to the pdf. The print link command can be used to to add a link to external url or an internal link within the document as defined by the print anchor command. To use the print link command you specify a target for the link and a rectangle describing the area on the page that will link to the given target. To find the rect of the link area draw a graphic over the area you want to link to a url, make the graphic transparent and make a note of the rect of the graphic. 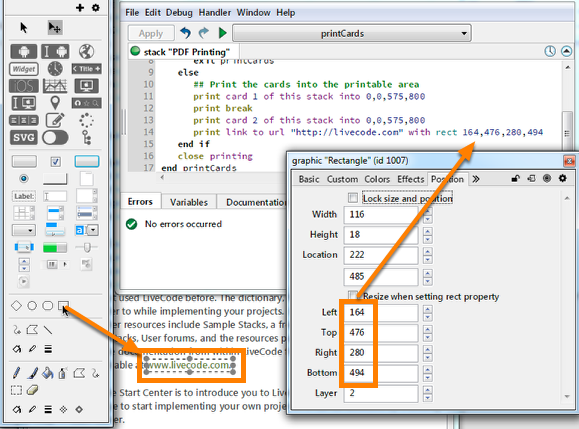 Then update the printCards handler to print the link to the pdf. When you open the PDF that is created that area of page 2 should link to livecode.com when you click on it. The print bookmark command can be use to create a document outline in the PDF. The print bookmark command is used similarly to the print link command we used in the previous. To use it you specify the bookmark title, level and location where the title is the name of the bookmark which will be displayed in the outline, the level is the depth of the bookmark and the location is an x,y coordinate describing where on the current page the bookmark will be placed. in the message box, this will give you a coordinate you can use. Next: How do I Create an HTML E-Mail? This works fine on all platforms except my iPAD. I have added "launch document tPDFPath" to this script so the pdf opens automatically as well as saving to the documents folder. However, when attempting this on the iPAD device, nothing happens. The PDF does not open, or I cannot find where the pdf is saved on the iPAD. Can you shed any light on this? I have trawled through the forums and still no joy. you can display the PDF on iOS using native controls. Have a look at "mobileControlCreate" and "mobileControlSet" in the context of "browser". 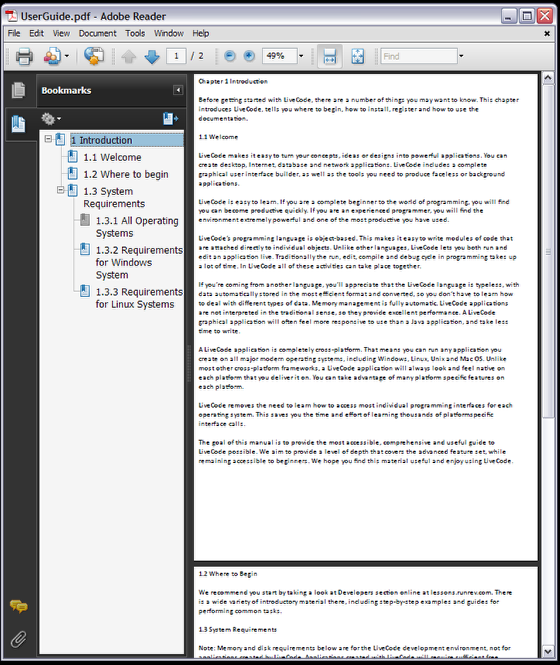 LiveCode does not have a built in utility to convert PDFs into the content components so that you could manipulate them freely. Implementing such a functionality manually would be outside the scope of a lesson here. If this is something you are interested in, I would recommend looking for command line tools or applications that have an API you could hook into from LiveCode. You could then either use the "shell" function to execute the command line tool or create an external to hook into the API calls. any suggestions I am building a desktop app. In the meantime you can work around the bug my manually including the file revpdfprinter.dll in the Copy Files pane of the Standalone Application Settings. You can find this file in the top level of your LiveCode folder. I ran your stack on a windows 7 machine. machine? This will give me a better idea of what you are experiencing. I am using Win8 and WinXP. Actually there is no PDF created. Prior to your post, I also added a 'button' and script, and it prompted me to create a PDF and then printed just fine but, you also get the image of the 'button' on the printout. As this script when run captures and prints all items on the card. I do not see any step in the lesson where the user is instructed to add a 'print button' nor dose it show in the example images. I may have misunderstood the intention of the lesson as I assumed after creating the stack I would be able to create PDF's of the contents of the cards field only. 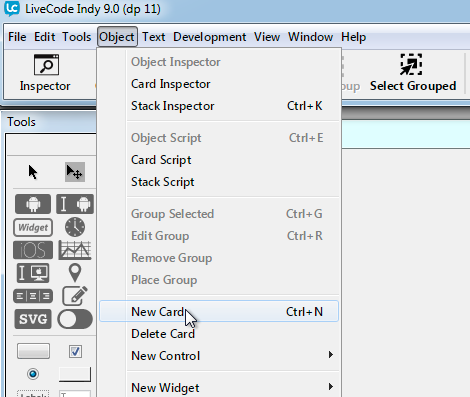 the code in the original sample stack is for demonstration purposes and can be called by typing "printCards" into the message box. If you are adding a button, then the script will print everything that is on the card. Before printing you could hide the button, and after printing make it visible again. This only makes a PDF at screen rez-- any ideas on how to make this export at 150 or 300 dpi? The engine rasterizes anything it has to at 4x normal scale when generating a PDF. However, it tries to keep as much as possible as vector (e.g. text etc.) so res shouldn’t be an issue. Could you send us a sample of the PDF you have created to take a look at? I have generated QR-codes with livecode-library sQuiRt. Works fine. But it is not possible to print the QR-codes in a clear and high resolution – they are looking really bad. The Text and one logo I had imported "as control" were fine and smooth. What can I do to improve the printtoPDF of the QR-code images? The Development Team will pick up the bug report and investigate. You can add your email address to the CC list on the bug report if you would like to receive emails when the status of the bug is changed. Thank You. I will wait for the solution and I'm impressed about your support and fast communication.